Congratulations to Medical Solutions' 2014 Nurses of Tomorrow Scholarship winners! Along with our staffing efforts, which work to improve patient care throughout the country, Medical Solutions finds it very important to help encourage and support the next generation of nurses. 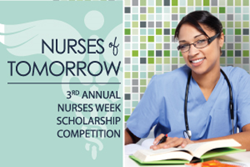 Each year, in celebration of Nurses Week, Medical Solutions hosts the Nurses of Tomorrow Scholarship competition as a way to support the education of future nurses, nurse leaders, and nurse educators. Each winner receives a $1000 scholarship to help assist with his or her tuition and/or related expenses. Alonso wrote that he would never forget the value of compassion. Rachael wrote that “Exceptional care is being part of a human interaction,” and Amanda recalled her “nursing role model” Mary, and expressed her goal to “be someone’s Mary” by providing exceptional patient care as a nurse. Click here to read more about Medical Solutions’ three amazing Nurses of Tomorrow Scholarship winners for 2014.